KEY CONCEPT: Addition and subtraction with money. 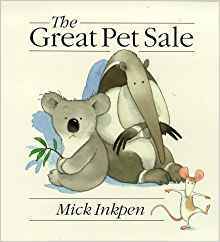 DESCRIPTION FROM THE PUBLISHER: Most young children fantasise about buying the contents of a pet shop and in the great pet sale all the animals must go: A platypus, terrapin and gecko are all at knock down prices. The koala and anteater are 9p the pair! A box of assorted brown things is only 20p. The little rat with the half his whiskers missing thinks he is the best bargain but just how many pets will the little boy be able to buy with his £1?